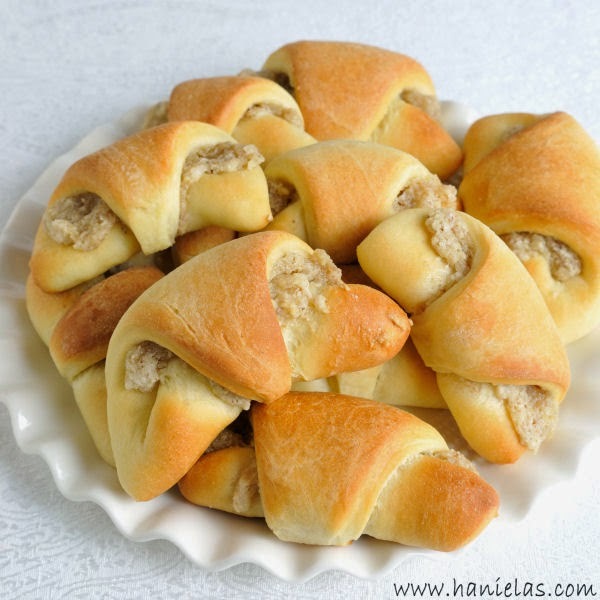 We love walnuts and we also love good homemade rolls. Coming the 2 and you’ll get Walnut Crescent Rolls. 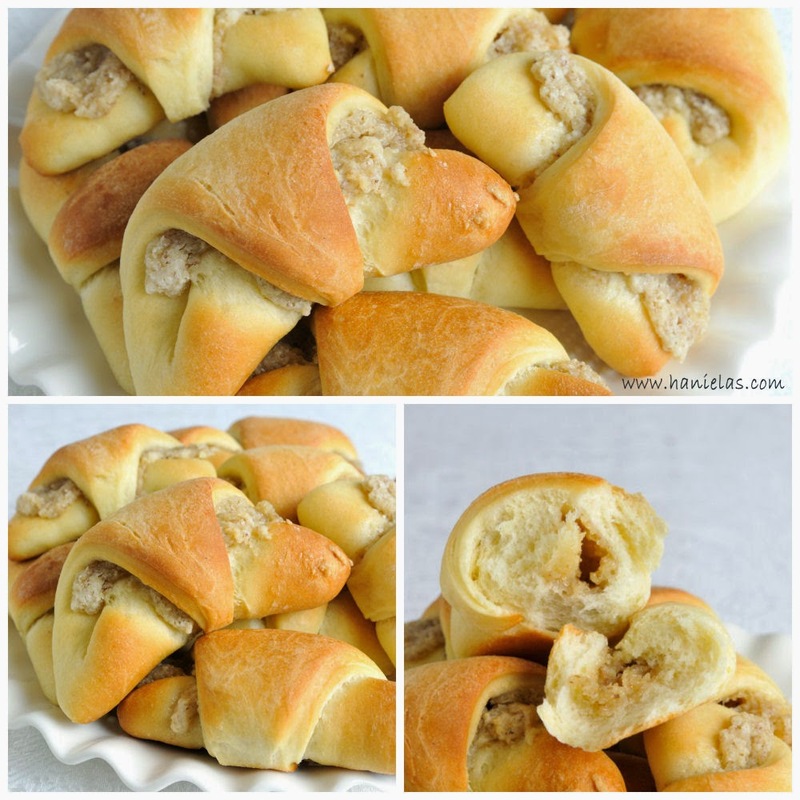 Yeast dough for the rolls is pretty easy to make and can be used to make cinnamon buns and other yeasted breads. Prepare Yeast Mixture : in a small dish whisk together warm milk, 1/2tsp granulated sugar and dry yeast. Set aside for 5 minutes. Into a bowl of your mixer add flour, granulated sugar, and salt, stir. Once yeast mixture is foamy on the top, make a well in the flour, add yeast mixture, egg, egg yolks, oil. Using a hook attachment, knead on low speed for 5 + minutes. Scrape the bowl as need to get all the flour incorporated into the dough. Dough is soft. Once smooth, invert bowl with dough onto a floured work surface. knead with hands until you have a smooth ball, about 5 minutes. Transfer dough into an oiled bowl. Cover with plastic wrap or damp paper towel/kitchen towel. Let rise for 1 hour. Proofing Tip: pour 3-4 cups of boiling water into an oven dish. Place this dish into the oven on the bottom rack. Place the bowl with the dough on the rack above. Close the oven, let rise. Once dough has risen, invert onto a lightly floured surface. Cut into 4 sections. Knead each portion into a ball. Using a rolling pin roll each ball into a round. Cut round into wedges using a knife or pastry wheel. Brush some milk on the narrow part of the wedge. Spread the filling on each triangle. Lift the wide side of the wedge/triangle and roll it up. Place rolls on the baking sheet. Brush crescent rolls with milk mixed with 1/4tsp melted butter/1/4tsp oil. Let rise for 40 minutes. Bake at 350F for 18-20 minutes, until golden brown. These can be frozen, let come to room temperature before serving and for quick reheating microwave. In a bowl stir together ground walnut and powdered sugar, gradually add warm milk, until you have a paste like consistency. Add 1tbl rum, stir again. Cover, set aside. Let’s make Walnut Crescent Rolls, see the video tutorial for step by step instructions and a tip on yeast dough proofing. Serve rolls with tea, coffee or milk.